For the vinaigrette: Heat the olive oil in a saucepan set over medium heat, until hot but not smoking. Add garlic clove, vanilla bean and chiles, and cook about 15 seconds, stirring constantly. Be careful not to let them burn, remove the pan from the heat and pour its contents into a mixing bowl to cool. Combine the safflower oil, red wine vinegar, salt pepper, allspice and sugar into the same bowl. Pour all the mix in the blender, puree until smooth, and reserve. The vinaigrette will be textured as the vanilla bean will not let itself be entirely pureed. But that makes it even more delicious! If you will not use the vinaigrette in the next couple of hours, cover it and refrigerate. It will keep for a week, but re-emulsify or thoroughly mix, before using. For the grilled pineapple: Heat a grill pan, a grill or nonstick skillet over medium heat until hot and lightly coat with safflower or corn oil. Place the pineapple slices and cook for about 4 minutes per side until they are slightly charred. Remove from heat. Once they are cool enough to handle, cut in half, remove the core and cut into strips along the grain. Reserve. For the shrimp: Sprinkle the shrimp with salt and pepper. Heat the butter and oil in a saute pan over high heat. Once the butter sizzles, add the shrimp, you may need to do it in batches so they they don’t overlap, and cook for 1 to 2 minutes per side. They should have plumped up and changed color on both sides, but be careful not to overcook them. Remove and reserve. To assemble the salad: Place the greens in a salad bowl. Drizzle some of the vinaigrette and toss, so that they are lightly coated but not soaked. Assemble on individual salad plates. 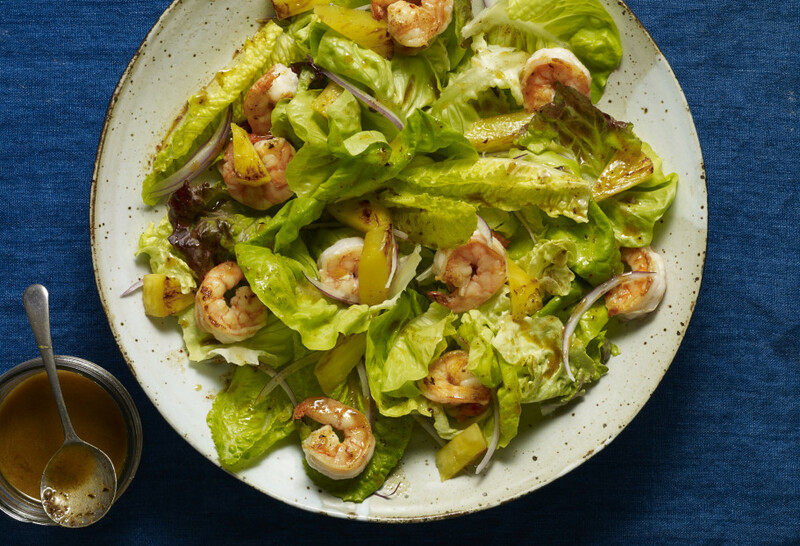 Divide the shrimp, pineapple and red onion on top of each plate. You may drizzle a bit more of the vinaigrette on top and serve.